Known for their unique biology and aggressive behavior, the vorcha of Heshtok are a primitive race that live among the galaxy's darker and more dangerous locations, such as Omega. Many vorcha are trained by the krogan Blood Pack as mercenaries due to their savage nature and adaptability to different environments. The rest of galactic civilization regards them as pests and scavengers, and their presence is generally seen as a blight. The vorcha are the shortest-lived sapient species currently known, with an average lifespan of only 20 years. The vorcha are known for a rather unique biology that differentiates them from other known species and which carries with it a striking set of advantages and disadvantages. The vorcha have clusters of non-differentiated cells, similar to those found on the planarian worm of Earth. These cells allow the vorcha limited regenerative abilities, as well as the ability to adapt quickly to its environment, such as developing thicker skin after being burned or increased musculature to survive in high gravity. However, as a consequence of this, the vorcha as a species no longer evolve as other races do. The vorcha equivalent of DNA has remained unchanged for millions of years. There is no need for them to evolve as a species when they can adapt as individuals. Vorcha society is built around combat. In fact, the vorcha use combat, both individually and in groups, as their default form of communication resulting in their communications being primarily non-verbal. The vorcha are a clan based people who prefer living in communal environments with others of their species to living alone or in the company of alien races. 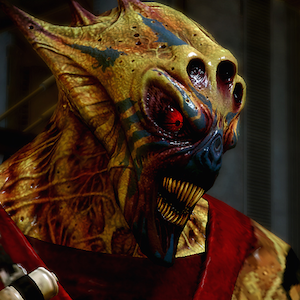 Seeing the potential of the vorcha's individual adaptability, krogan Blood Pack mercenaries often sweep pockets of vorcha, gathering them up and literally beating them into soldiers. Vorcha "trained" by this ordeal are stronger, faster, smarter, and more resilient than other members of the race. Gaining even a few vorcha gives a mercenary band a formidable advantage; each additional vorcha magnifies the gang’s combat ferocity exponentially. Shortly after the vorcha's discovery, several asari mining corporations adopted vorcha orphans from Heshtok, raising them to live nonviolent lives and employed them in the mining industry on Parasc. While these efforts were at first labeled colonialist, the orphans became minor celebrities when it was discovered that the vorcha habit of using violence to communicate was not completely innate. Several spoke throughout Citadel space on behalf of their species, but their short life spans kept their careers very brief. Even today, companies that want vorcha labor have the poor choice between adopting and educating them as youngsters just to watch them age and die or dealing with autonomous but violent adults.